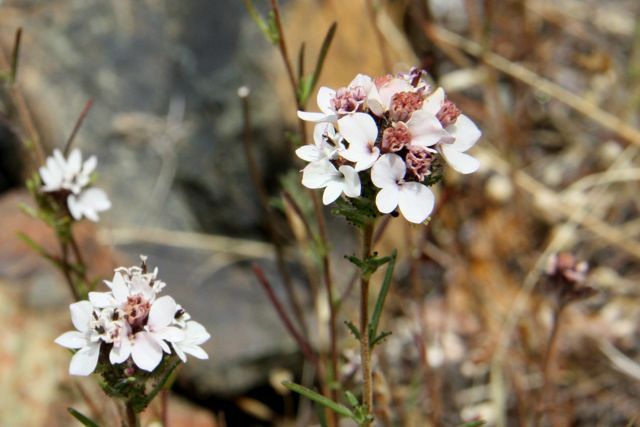 Growing across a rocky bed of serpentine is a field of low white flowers. Look close, and you see that the leaves and stems are sticky and thick with white hairs. Nestled among the hairs are little dark dots that are actually glands. This is what makes it sticky – and also the source of the name, Calycadenia multiglandulosa. You’ll usually see this little plant on serpentine, and only in California. 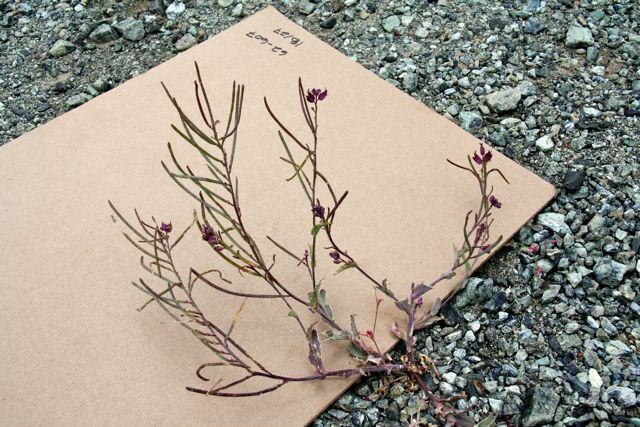 On a bare serpentine outcrop high above the Pacific ocean is a low leafless stalk with a few small purple flowers. This is the Mt. Tamalpais jewelflower, a sub-species of Streptanthus glandulosus which is found only in Marin County. Though the plant is unassuming, when you look close the flowers have earned their name. Narrow, crinkled petals flare out above a colorful pouch that is faceted and luminous like a gem. The jewelflower is in the same family as radish and milkmaid. The long, narrow, fleshy seed pods that are pictured below are typical of the family, though the unusual flowers are not! I saw this beauty, S. glandulosus ssp. pulchellus, near Rock Springs on Mt. Tam during the MMWD/Cal Academy Bioblitz last weekend, and owe thanks for the ID to Terry Gosliner. 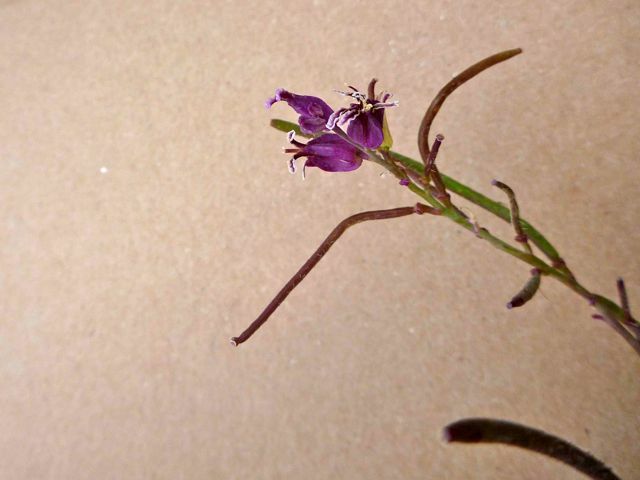 I wrote about secund jewelflower back in May – which is also a sub-species of S. glandulosus, and the only jewelflower in Marin that isn’t listed as either rare or endangered. Like dried flowers in a storebought display, California everlasting has crispy, white, straw-like petals. But actually these petals are bracts – you have to look close, and at the right time, to see the real (yellow) petals peeking through from the flower inside. When done flowering, the bracts open wide around a dandelion-like puff of seeds. Pseudognaphalium californicum is a native that’s found in most parts of North America. It’s in the Asteraceae family, along with dandelion, chamomile, burdock and daisy. It dries out as nicely as its name suggests! There are several similar-looking species to this one, including others in the Pseudognaphalium family. But I first mistook this plant for the very similar lookalike: pearly everlasting (Anaphalis margaritaceae – thanks to Doreen for setting me straight!). I’m still trying to figure out a good way to tell the two apart – in the key, the main difference is that California everlasting has a taproot while the roots of pearly everlasting are fibrous. I think that the flowers of the first are either bisexual (a typical flower, with both male and female parts) or only female, while the latter has separate male and female flowers. But since they are in the aster family, with little teeny tiny flowers, this is a hard difference to spot. 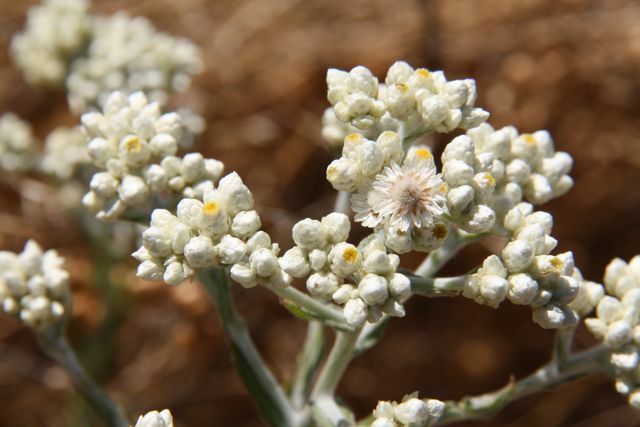 Just from looking at the photos, it seems that California everlasting has a much sleeker, smoother look to the shape of the bracts, while pearly everlasting seems to have a spiky look to each flower head, with the many pointy tips of the bracts bent backwards a little bit. I’ll offer more tips on how to tell these two apart, as I come up with them! These flashy pink flowers are everywhere right now. Like the Tangier pea that I wrote about a few weeks ago, the sweet pea (Lathyrus latifolius) is an escaped garden plant. It has many sweet-smelling pink or purple flowers growing at the end of climbing stalks. The stem is dramatically flared, or winged, with a flat leaflike shelf projecting out from either side. The leaves are narrow and paired, like bunny ears. As I mentioned in the last pea post, there are several different kinds of sweet peas growing in the area – I had always thought there was only one! Today’s post is about the true “sweet pea”, which is distinguished by the broad stem wings and by the fact that it’s a perennial, not an annual. You can tell the non-native sweet peas from the native species by looking at the leaves. All the non-natives have the paired “bunny ear” type of leaf, while the native species have many (more than five) leaflets on a stalk. Growing alongside a meadow stream are many spikes of pale flowers. This is marsh zigadene, or Toxicoscordion micranthus. A few long, linear leaves sit unobtrusively at the base of the plant, which is decked with several dozen creamy white blossoms. The six-petalled flowers have a small yellow spot at the base of each grooved petal, and a short tight cluster of stamens with oversized anthers. Marsh zigadene is a native that is usually found growing in damp places, often near serpentine, according to the Flora of Marin. It’s common in this county but is rare elsewhere. The common name for the several similar-looking species in the Toxicoscordion genus is “death camas.” These species are another example of highly toxic beauty. I have always known these plants as Zigadenus species, but they were recently moved to a different group (something that is always happening in the botany world – it can be hard to keep track!). They are still listed in most floras under the old name, but are in online databases under the new name. 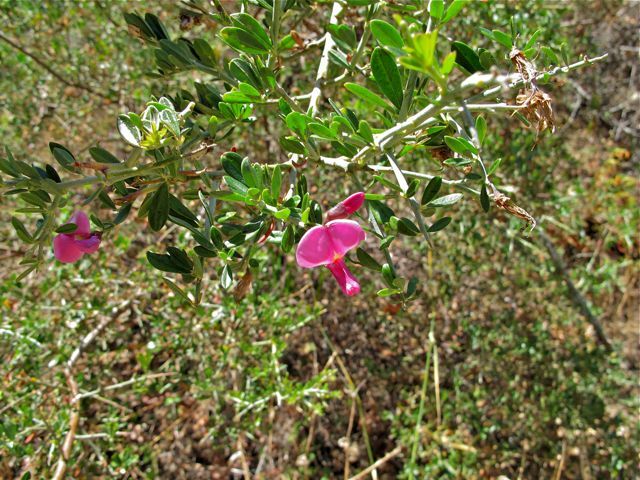 At first glance, the chaparral pea looks like a French broom… with bright pinkish-purple flowers. But this pretty bush is a California native. Pickeringia montana has medium-sized flowers and three-leaftleted leaves that are a shiny, vivid green. 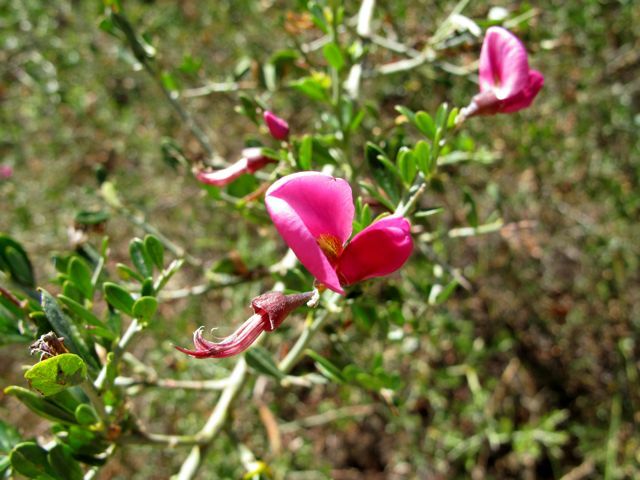 It can grow to more than six feet tall, and sprawls a little – just like broom does. But if the color and the shiny leaves weren’t enough to convince you that this isn’t a broom, then the thorns might do the trick! So watch out for it when you’re hiking. It’s often found (as the name suggest) in the chaparral. Black-tailed deer love to browse on it, delicately nibbling their way around the thorns. This pretty shrub doesn’t reproduce well by seed in this area, but it does spread by rhizomes (spreading underground stems) or from its own roots. It comes back strongly after a fire has burned through. A constellation of yellow lilies blooms on a serpentine ridge atop Mt. Tam. The yellow mariposa lilies (Calochortus luteus) are little works of art: delicate patterns of red and orange decorate the inside of the petals. No two are alike. Some are plain, some are complex. All are lovely. Beetles seem to think so too; I’ve often seen them hanging out inside. When I saw the ones pictured here, some still held water from the previous night’s rain in their cup-shaped blossoms. This mariposa lily is a California endemic that can be found as far north as Humboldt and as far south as LA. Conium maculatum isn’t native to California, but it is found throughout most of the state, often in open or disturbed places. Plants can grow to more than six feet tall, and have many flat umbels of lacy white flowers. Its similar-looking cousins, water hemlock, are also poisonous. But when I saw some on the open space above Mill Valley the other day, the lady bugs were having a wonderful time hanging out on the hemlock flowers! If you walk through a patch of bedstraw, you’ll know it right away. The stalks grow long and sprawling, and will wrap around your ankles. But they also are sticky! And the leaves are studded with tiny hook-like bristles! They don’t hurt to brush up against, but they certainly do cling. 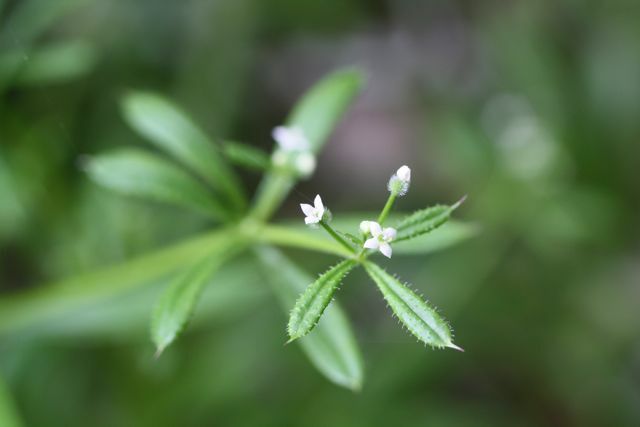 Its other names include goose grass, cleavers – and stickywilly. 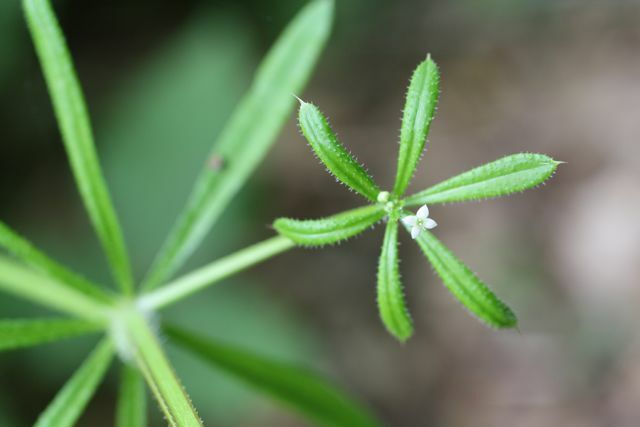 The flowers of Galium aparine are tiny, white, four-petalled stars. But the plant’s most distinctive feature is its leaves: they stick out all around the stem like the spokes on a wagon wheel. Bristly, green, tongue-shaped spokes. Bedstraw is widespread – not only across California, but throughout the US and southern South America, as well as Europe. A Scottish friend was just telling me that kids will grab handfuls and stick it on one another as a game. It’s listed as a native both in California and in Europe, but is described as an invasive/non-native in other states (like Arizona), so it is clearly aggressive. Bedstraw is used as a medicinal plant, taken as a tincture, juice or tea to treat maladies such as adenoids, nodules, kidney stones, roseola, and cough. It’s also been used on the skin to treat psoriasis, and eczema. A bough of pink flowers droops down at me from the nearby tree. But I’m not looking at a blooming branch; the narrow, twining stem is tough but not woody enough to stand this high on its own. Here is a pink honeysuckle, or Lonicera hispidula. The whorled cluster of flowers perches at the end of the vine, right at eye-height. They don’t always grow this way (I’ve seen them at ankle level alongside trails) but I got lucky this time with an easy view of the pretty flowers. The upper petal is a soft, rosy pink and is dramatically rolled back. Five stamens are on prominent display, waiting for a passing bumble bee or hummingbird. Each stamen is T-shaped, with the brown bar of the anther dusted in pollen and delicately balanced on the greenish-yellow filament. This vine is often recommended for native plant gardens because it is so attractive to birds. Hummers love the sweet nectar, and other birds feast on the berries. Honeysuckle is easy to recognize even when it isn’t blooming because the pattern of leaves is distinctive. The oval leaves are paired, and often fuse together into a disc around the stem when they are young. More mature leaves are separate, but often have a small leaflet at their base that is fused to the stem.